Today we continue to explore ways to play with color to spruce up your knitting, using the very soft and warm Dona yarn of Universal Yarns. As I explained earlier this week in my yarn review, Dona yarn is a great alternative to acrylic as it’s 100% superwash merino wool. Duplicate stitch is one easy way to make knitted stripes and have a lot more interest. You start with a canvas of stripes of the same or different widths, whichever suits your fancy. And then you work duplicate stitch on top to change things up. If you’ve never used a stripes calculator, give this free one a try; it’s a great tool to help you come up with random stripe widths. Once again, I swatched with the feature yarn of this week, Dona. The sharp contrast between black and white is fun for doing little motifs in duplicate stitch (which is also called Swiss darning or Swiss embroidery). 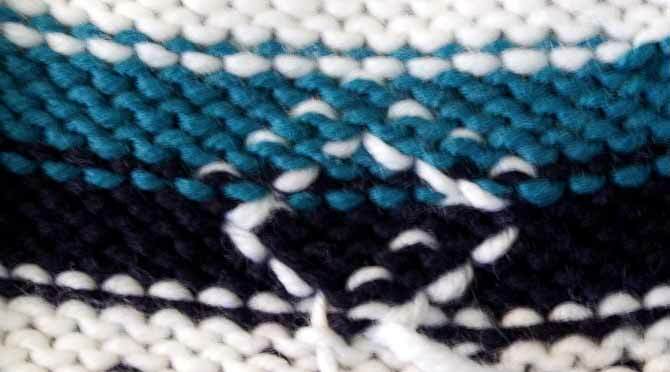 I enjoyed seeing how the sheen of my favorite color, teal, would jump out at me as part of the random stripe sequence I knit with embroidered motifs crossing two stitches. This is what it looks like. If you look at the third black stitch in from the left side of the photo, you can see one of the perils of duplicate stitch on your knitting. I tugged the tail too tightly and the first stitch all but disappeared into the base fabric. But with a little gentle tugging, this is easily fixed if you do it right away. It’s important to use the same thickness of yarn when applying duplicate stitch motifs because a thinner yarn leaves the underlying stitches exposed and a thicker yarn starts to create an unseemly bulk on the surface of the knit fabric. In this close-up, it’s possible to see where I made a few mistakes. Sometimes I tugged on the yarn a little too much, and other times, I was a little too loose. It doesn’t take long to practice duplicate stitch to the point where your stitches are consistent and lie flat on the base fabric. You’ll notice on the leftmost white stitch that the right leg lies on top of the left leg of the stitch. This happened because of how I brought the yarn up from the wrong side of the fabric. It’s important to work from one side of the fabric and move horizontally in one direction as much as possible to avoid these twisted stitches. If you look at the picture below. I used some drawing software to illustrate how the stitches are worked horizontally, with the strands of yarn showing through the knit fabric from the back side. Another bonus to working all the stitches in horizontal rows is the neatness factor on the back of the work. If you change directions and go all over the place there will be a lot of floats and stranding across the back, which leads to bulk and puffiness on the right side of the work. Below you can see how neat rows keeps the bulk to a minimum. Tomorrow we’ll look at a very useful tool to help colorwork knitting in general.